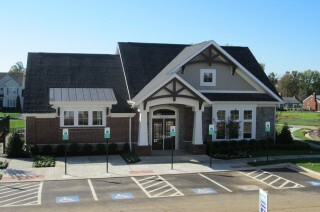 Hubert Delivers Clubhouse for Ryland Homes | Hubert Construction, LLC. Hubert Construction has completed the clubhouse at Ryland Homes’ newest Loudoun County Community, East Gate. The 2,393SF wood frame building with pool will serve as the gathering place for residents of this community which is currently under development, with it first homeowners recently taking occupancy. The building includes facilities associated with the pool, locker rooms, lifeguards office and equipment room, but it’s greatest asset is the community room which features a stone veneer, gas fireplace with flat screen television mounted above and a food service area with high-end dark stained cabinetry and a tile back splash. Hubert provided pre-construction services in support of Rylands efforts to deliver this project in conjunction with the first homeowner move ins and provide a marketing tool to attract home buyers. Hubert Construction is the Washington Area’s most prolific builder of community amenity facilities, having delivered over forty-five projects in the last ten years, including seven in 2014. Please contact Matt Shea at 301.721.4393, or m.shea@hubertco.com, if Hubert can add value to your next amenity project.